a ‘purple’ coalition, so named because it would combine the “red” Labour and “blue” VVD. Together, the two parties would command a majority with 80 seats. Including the CDA and the Democrats 66, which have both indicated they would join such a coalition, the government would command an incredibly strong 105 seats. The key impediment to a ‘purple’ coalition is the governing agenda — Samsom wants to cut the Dutch budget much more gradually than Rutte and, indeed, opposed against Rutte’s 2013 budget back in April. Samsom is also much more open to participating in future bailouts of Greece and other eurozone countries. This seems like the coalition that most of the media and other political elites want — it fits Dutch political tradition, as it would harken back to the ‘purple’ coalitions led by Labour prime minister Wim Kok from 1994 to 2002 and to the CDA-Labour coalitions of the 1980s. 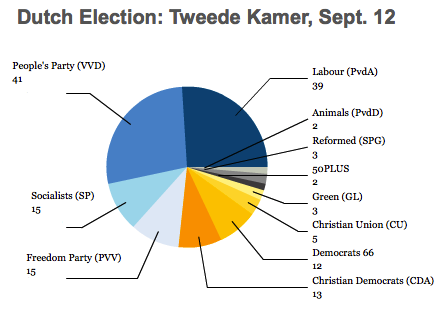 a VVD-led pro-austerity coalition with the CDA and, potentially, the Democrats 66 — together, they would hold 66 seats. If they convinced the Greens and the Christian Union to join the coalition, they would bring that total to 74, just one seat short of a majority government. Such a coalition would be a more center-right coalition that would not have to accommodate Labour’s skepticism on the budget, but as a minority government would be much more likely to fall within the next four years, and there’s no guarantee that the Democrats 66, the Greens or the Christian Union would necessarily sign on for accelerated budget cuts. This seems like a much more distinct possibility than it did just 24 hours ago — Rutte would prefer a government committed to his budget target and Samsom would rather remain in opposition than assent to budget cuts he opposes. a Labour-led anti-austerity coalition — the arithmetic here is tricky, as Labour, the Socialists and 50PLUS would together hold only 57 seats, and the Democrats 66 and the CDA have refused to join a coalition with the Socialists. Such an anti-austerity coalition would need the PVV to boost their government with outside support (perhaps as the PVV did with Rutte’s prior government) in order to begin to pass an agenda, but the PVV’s anti-European and anti-immigrant bent is anathema to Samsom, who would probably prefer to remain in opposition. This seems least likely. 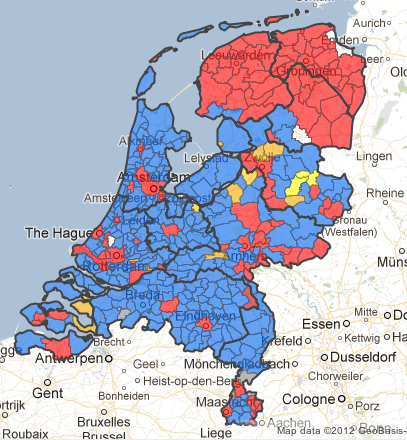 The VVD (in blue) took most of rural Holland and much of the rest of the Dutch hinterland. Labour (in red) swept the northern regions of Friesland, Drenthe and Groningen, as well as the cities in Holland and otherwise — Amsterdam, Rotterdam, Utrecht and the Hague. In Amsterdam, the Dutch capital, Labour won with 36% to just 19% for the VVD, 15% for Democrats 66 and 9% for the Socialists. The CDA (in bright yellow), which even in 2010 did very well in the Dutch heartland outside of Holland, this year was reduced to winning just a small part of Overijsissel in the center-west of the country. The PVV (in gray) was wiped out in the Limburg region in the south of the country and Maastricht, all of which it won in 2010. Good analysis. Just one point I think is worth adding in: the VVD-PvdA coalition would have a majority in the Lower House but not in the Senate. Hence the need to bring more parties into the purple coalition. The CDA would meet this need, but after two heavy losses might choose to stay out of government this time. The second choice would be a four-party coalition with D66 and GreenLeft. The five-party coalition set out in option 2 would have the same problem. It is possible to have a government without a majority in the Senate, but that would go against the strong popular desire in the Netherlands for stable government, reflected in the way voters gravitated towards the two largest parties in the final days of the campaign.